Spring is always the red tower of the May tree; alive, shaken with bees, smelling of honey; and the blood, a moving tree of May, (Judith Wright). Its spring – sort of – in the Southern Hemisphere. Today’s painting is Angelo Da Fonesca’s “Spring”. 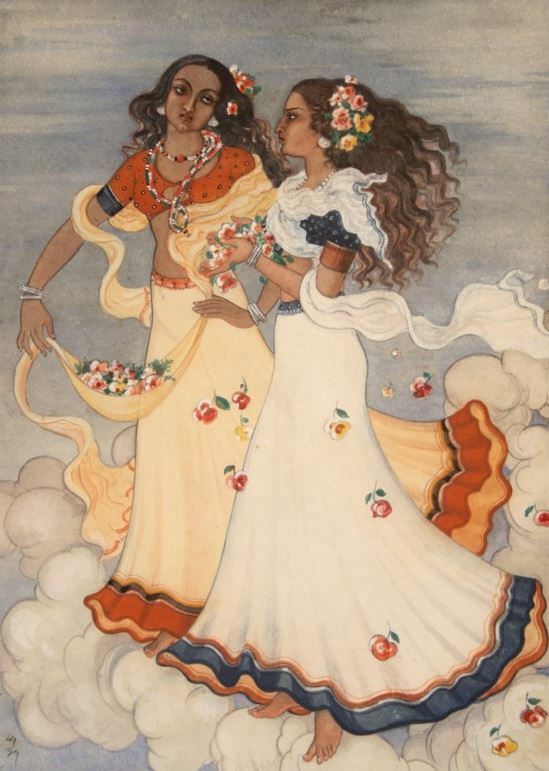 The girls in the painting wear cholis, reminiscent of the khaann patterns of Maharashtra, with flowing skirts and flowers in the hair. da Fonesca’s subject matter was universal but contained strong indigenous elements. This entry was posted in 1930s, Art, Colonial, Culture, Early 20th Century, Flowers, Girls, Goa, India, Indian Women, Paintings, Uncategorized, Vintage, vintage art, Vintage Blouse, Vintage Dress, vintage fashion and tagged 1939, Angelo da Fonesca, choli, Christianity, dupattas, goa, Indian dress, indigenous, painting, skirts. Bookmark the permalink. Thanks Mardi, off to check the poems you mention. Isn’t Judith Wright wonderful – I sometimes think think Australian artists have a sublime awareness of as you say the “aliveness of nature” and it shows in their art. Safe travels and enjoy-I just got back from India! Mumbai, Pune and Bangalore. I wish I could travel to other places but meeting up with family takes up a lot of time!